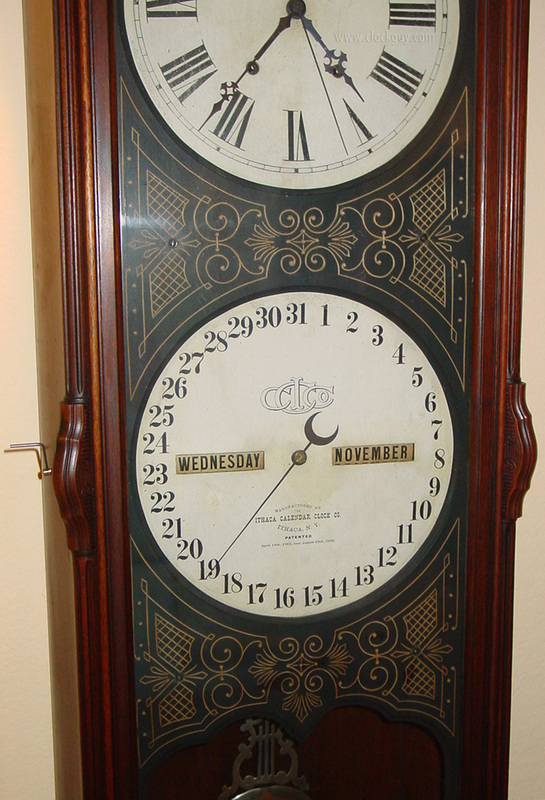 additional calendar clocks. 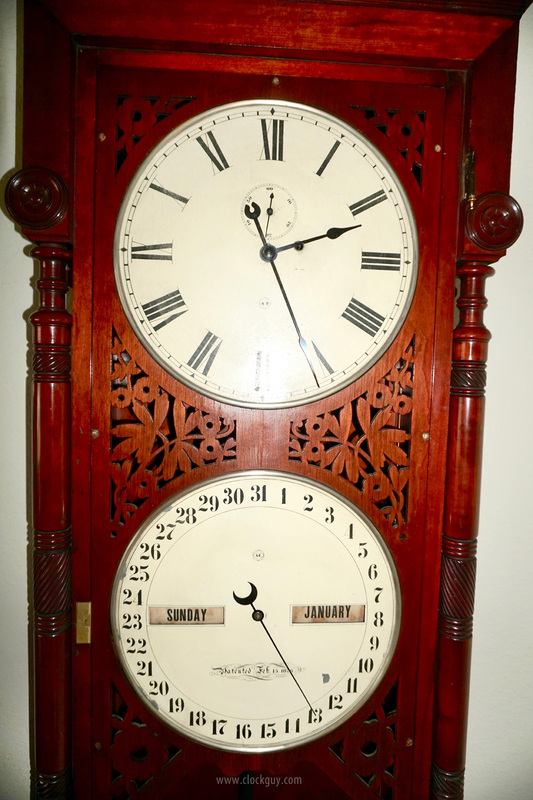 We have clients looking for both high-end and moderately priced calendar clocks. This is a great Seth Thomas model that we don't see very often. Housed in the very popular Seth Thomas Regulator No. 6 case, this particular calendar model was made in two different configurations, this being the earlier of the two. 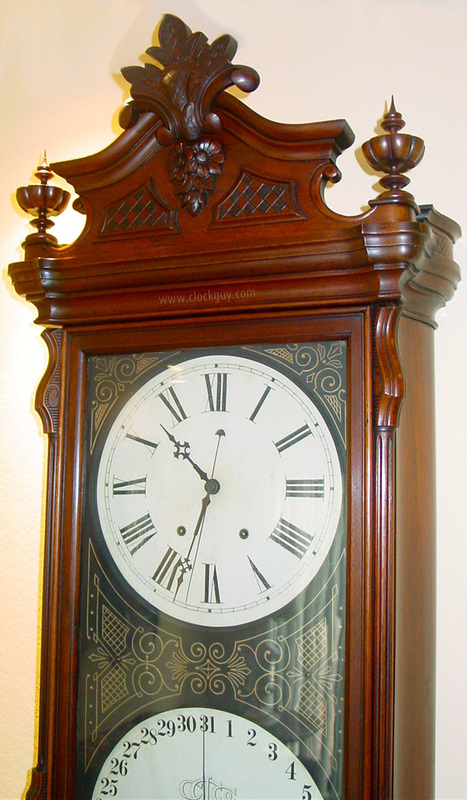 Physical: The beautiful walnut case measures 16"w x 49"h x 6" d and retains the original finish. The 10" original dials have the original paint with some older touchup. 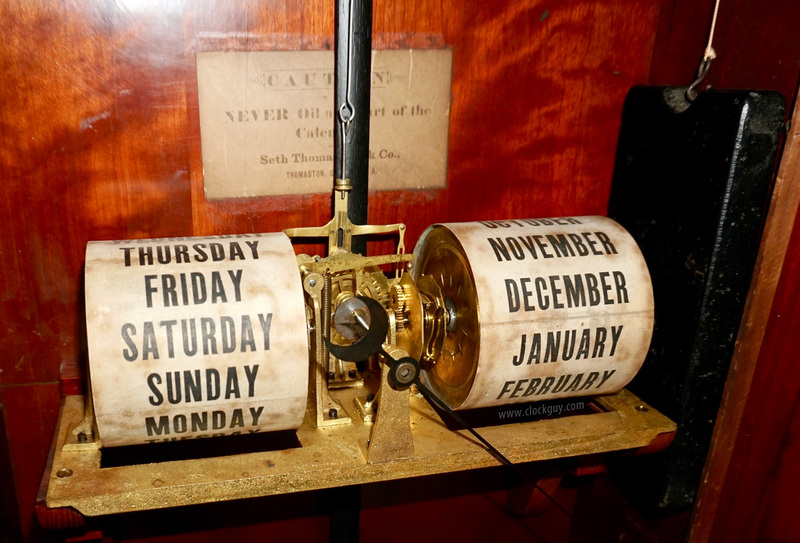 The roller papers on the calendar mechanism are original. The weight, which runs down the inside out of view is original and has a new cable. 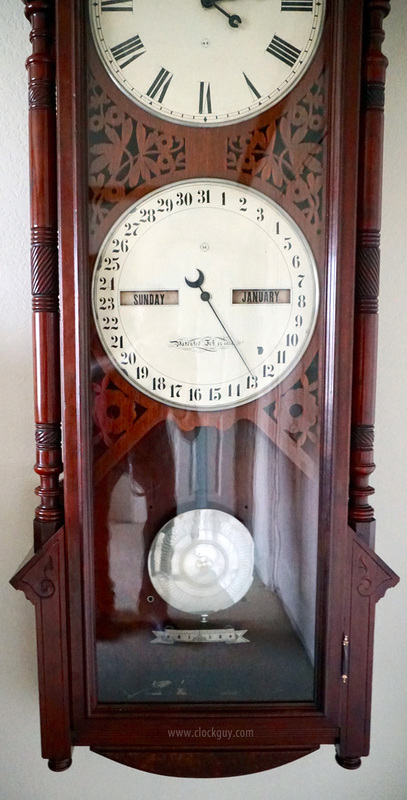 The clock also has the classic damascened Seth Thomas pendulum bob and original winding crank. The finials are correct and original. There is an original label inside in very good condition. 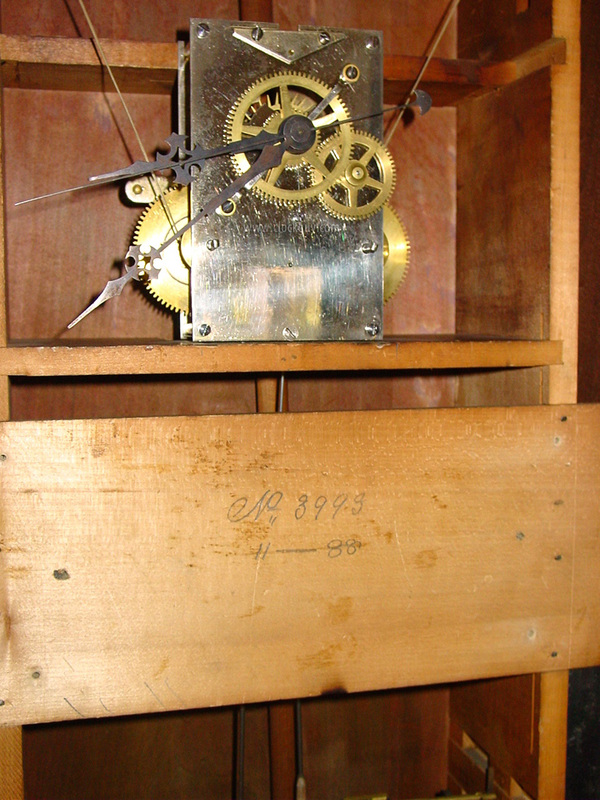 The date of manufacture is stenciled (always backward) on the back of the clock indicating December 1886 (6881L). 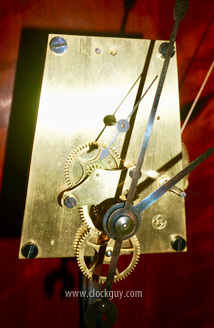 Mechanical: The clock and calendar movements were professionally serviced in 2018 and are both in excellent running order. Comments: We've only had four or five of these in the nearly twenty-one years we've been in business. They aren't often available, so here's your opportunity to own an exceptional example of a real Seth Thomas classic and at a great price. Give us a call to start the process! 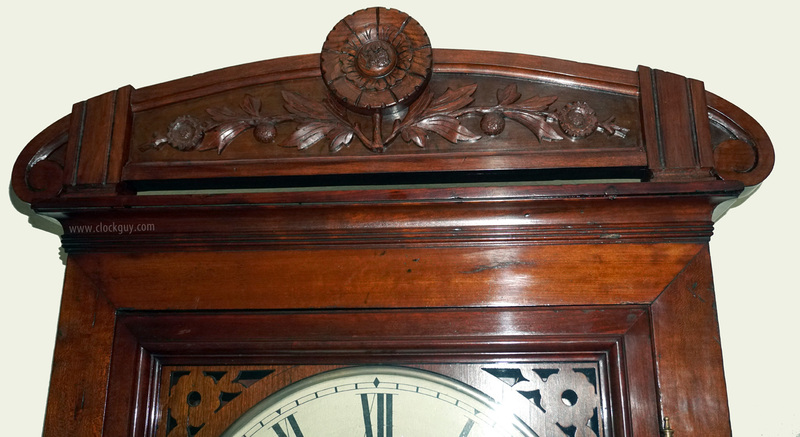 We are delighted to have this beautiful Seth Thomas clock for your consideration. 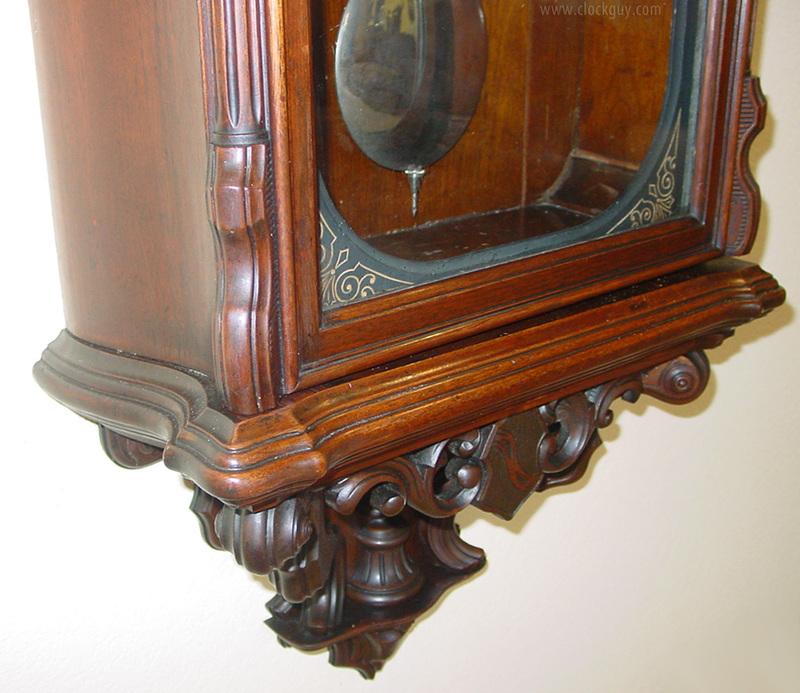 Because of the expense of the elaborate case, not a lot of this model were initially made and there are literally only a handful of these magnificent clocks still in existence, all held in major collections. According to research of Seth Thomas catalogues at the NAWCC library, the Office Calendar No. 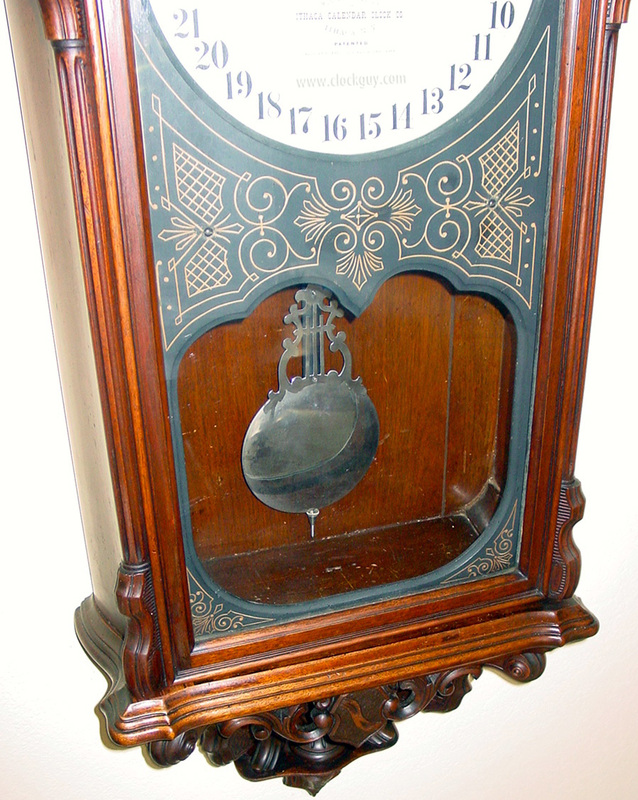 8 was manufactured only between 1880-1888. This one moved from NY in the 1980s to a major collection and has just been made available to us. 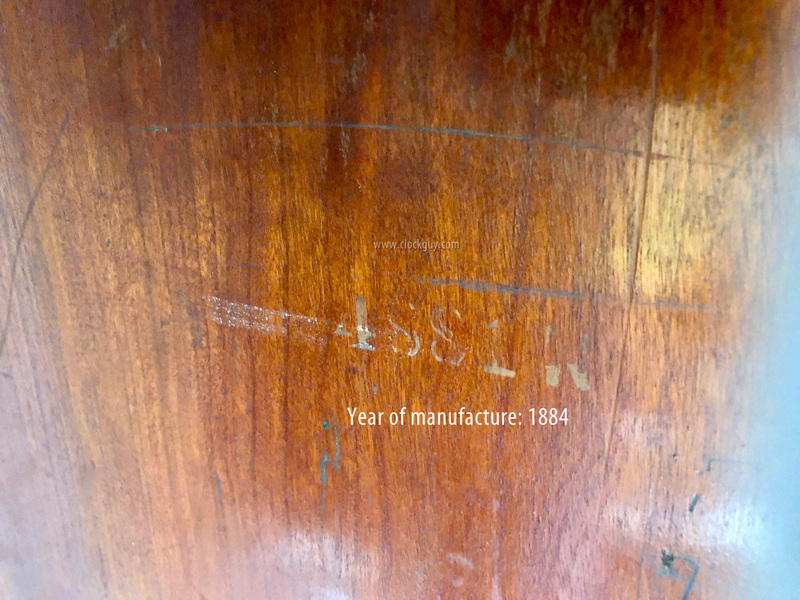 Physical: The walnut/burl case, which measures 24.5"w x 66"h x 9"d has a fine patinated finish that appears to have been restored well before its 1980s move. It is in excellent physical condition with beautiful color. All the wood is original as is the glass. 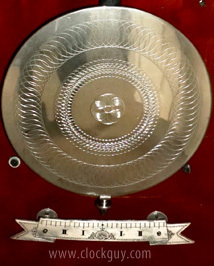 The nickel bezels were quite worn and recently restored. 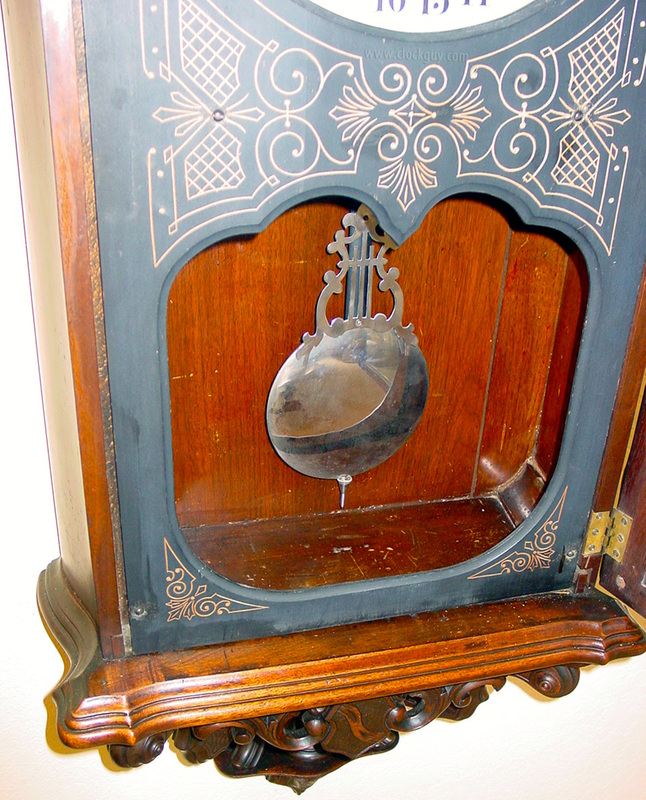 The damascened nickel pendulum bob is original. It appears that the weight has not fallen in the past and damaged the case (typical for an original gut cord to break). 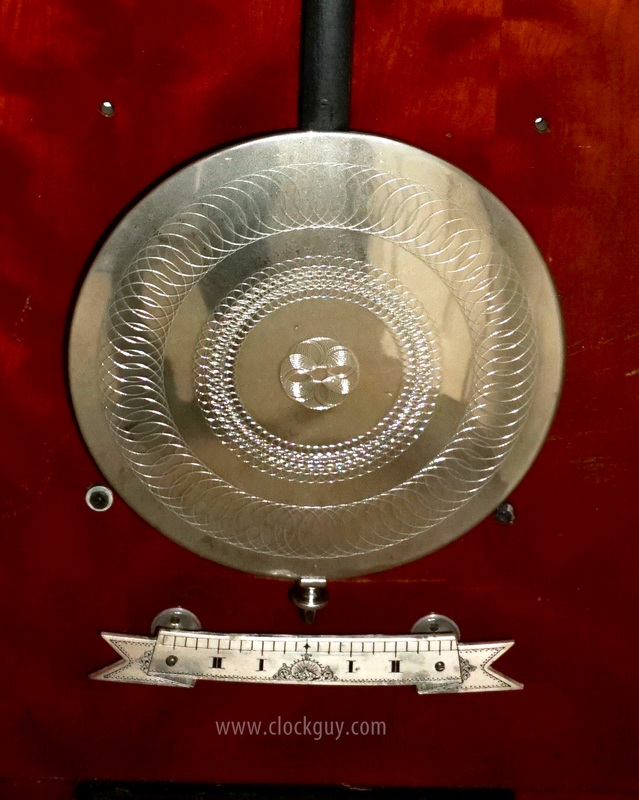 The 14" diameter dials are in excellent physical condition. They were recently touched up by our expert dial-painter. The left calendar roller has an indentation on "Tuesday" that might be remediated by a capable metalsmith, but we'd probably just leave it alone if it were ours. Roller papers on the calendar are original. The cabinet lock and key are present, original, and in working order. There is a cupola on top of the case that is unique to this particular rare Seth Thomas model. Note how it is turned even on the inside! Mechanical: Both the weight-driven eight-day clock and perpetual calendar movements have been overhauled and are in excellent running order. 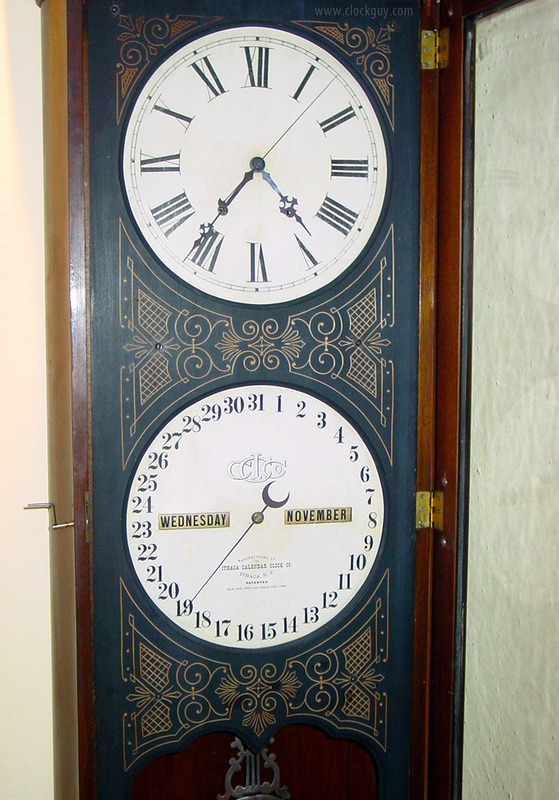 Comments: We have only seen three of this model before, one of which we restored and sold several years ago; we feel fortunate to have found this beautiful calendar clock and convinced the collector to make it available to you. Thanks in advance for your interest. In all the years we've been representing major collectors this is only the second one of this very scarce model that we've had available to us, and only the third one we've actually seen. 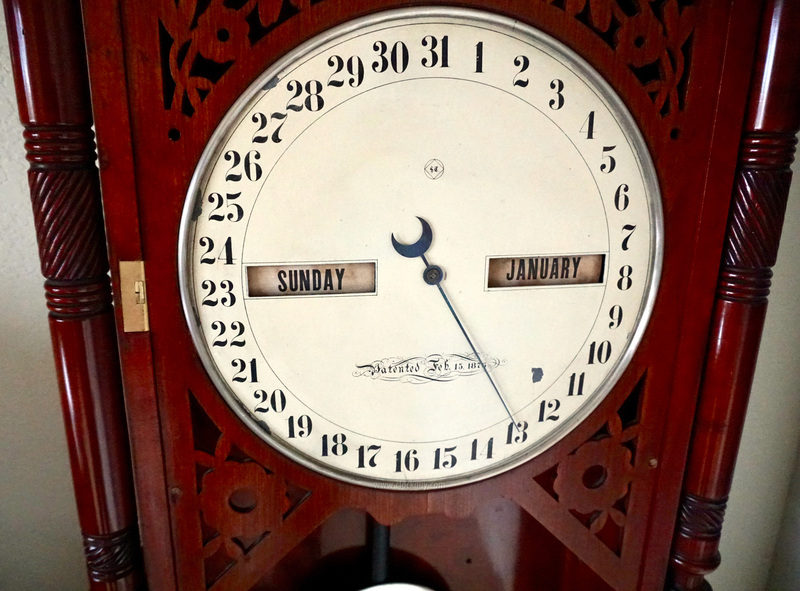 Tall and graceful, this splendid Victorian era serpentine-sided perpetual calendar clock made by the Ithaca Calendar Clock Co of New York with beautiful carved crest and lower pediment awaits your careful examination and consideration. Physical: The solid walnut cabinet with period graphite script serial "No. 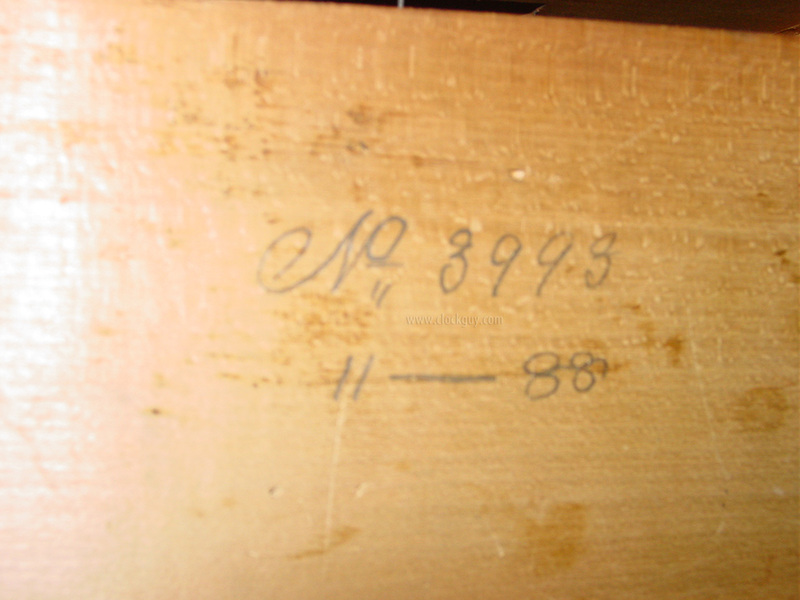 1993" and dated "11-88", measures 22"w x 72"h x 9"d is in excellent physical condition with original finish. 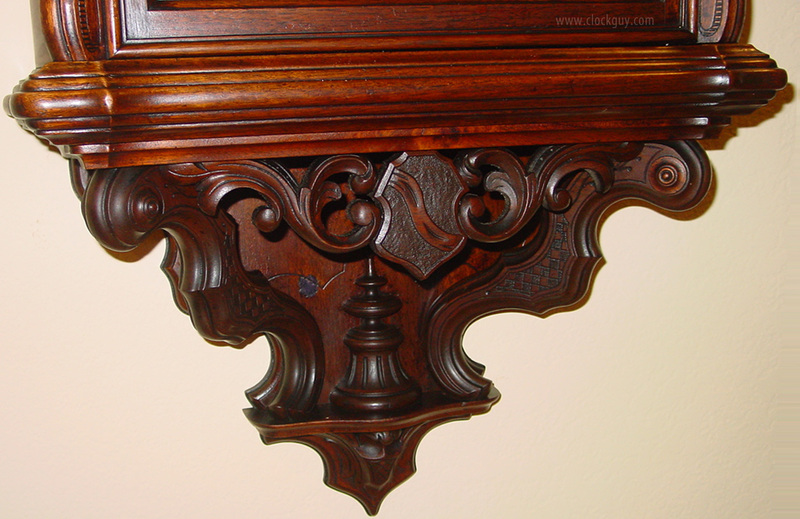 It has recently been thoroughly cleaned and professionally waxed to preserve the finish. 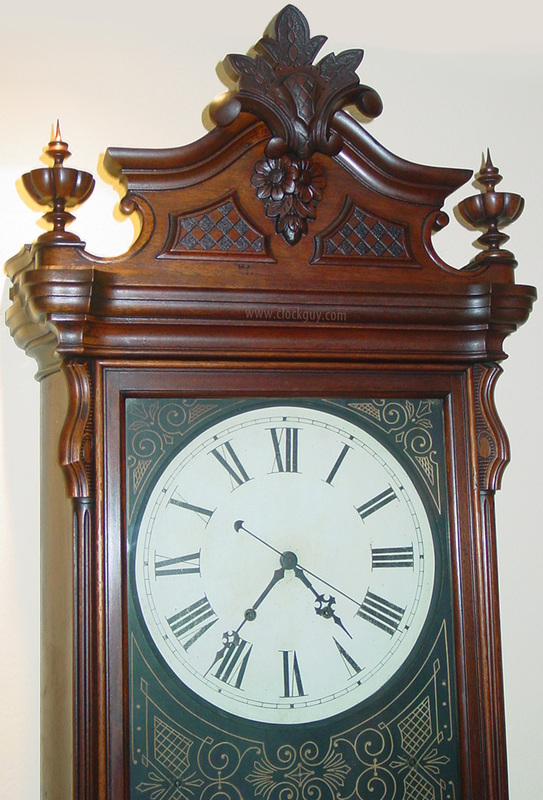 The incised dial-surround is in excellent original condition and really sets this model apart from others. The front section incorporates a large door that is fitted with glass. 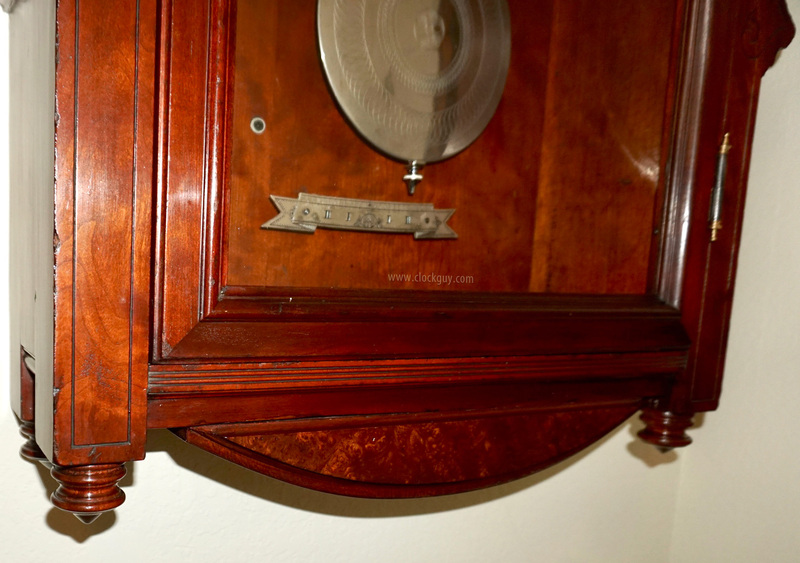 This opens to allow access to the two large paper-over-zinc dials. They both measure 12" in diameter and are in excellent original condition. The upper dial displays the time with Roman numerals and features a sweep second hand. 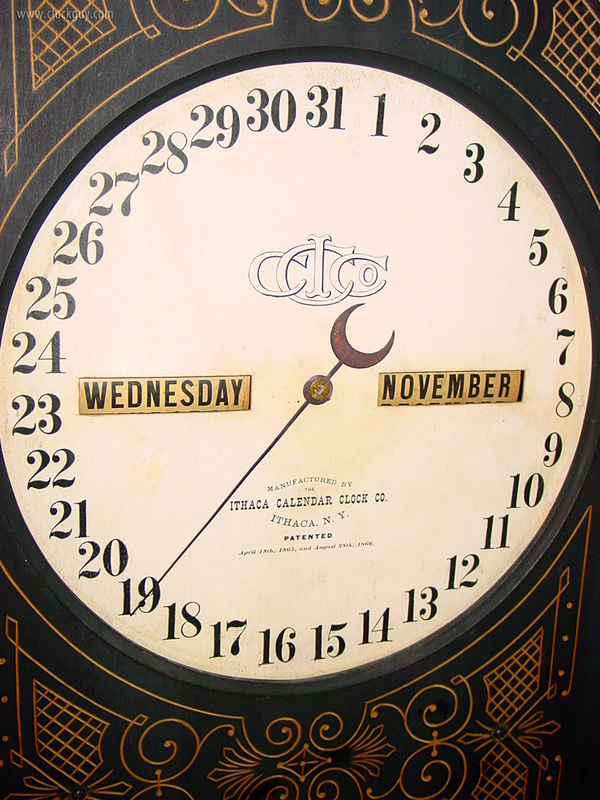 The lower dial displays the day of the week, the month and calendar day. 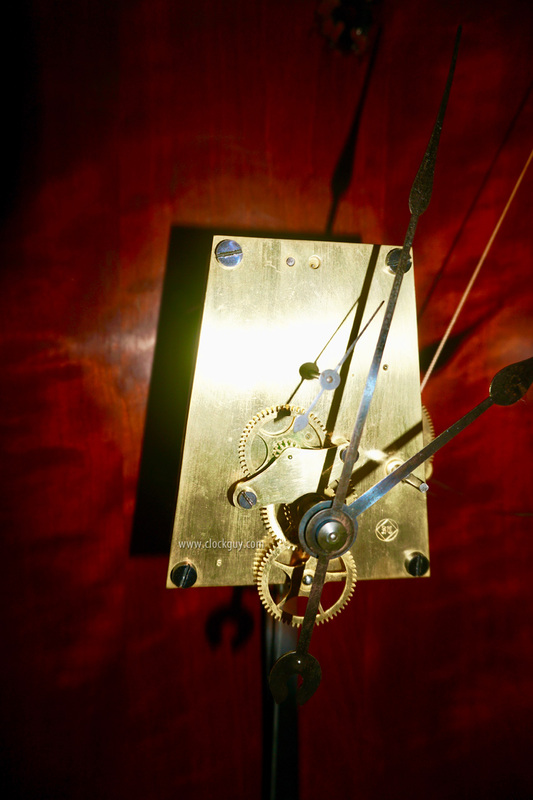 The nickel-plated lyre pendulum is in excellent and original condition. 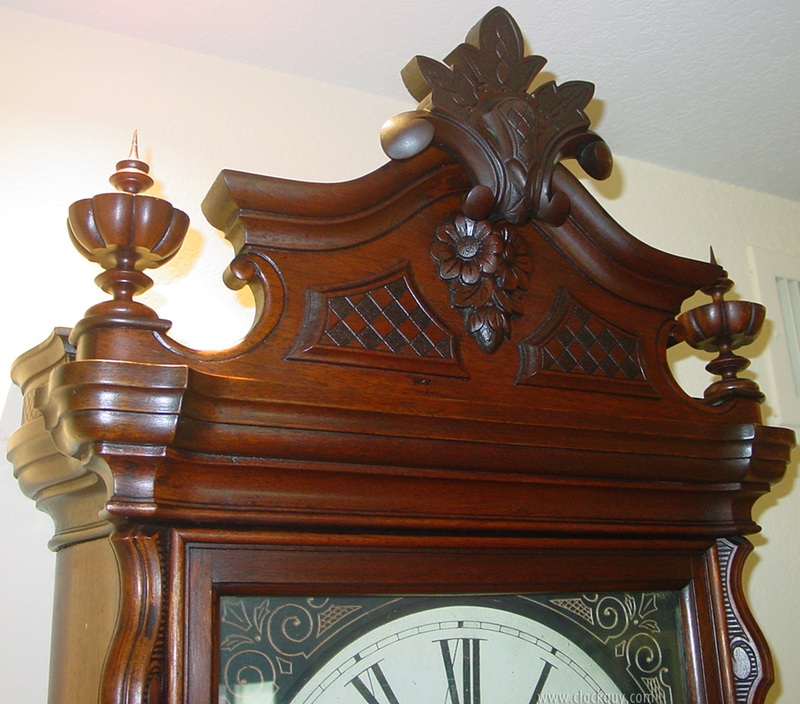 The two weights are original and correct as are the two finials on top. 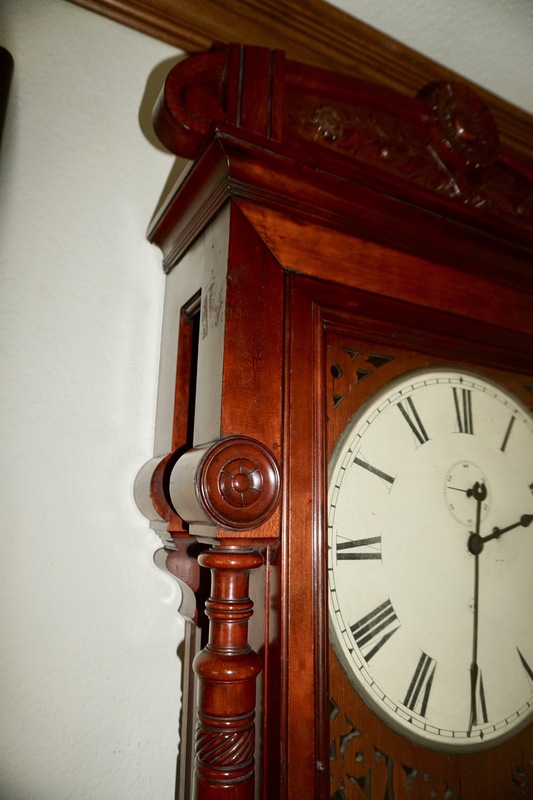 A previous owner filled two holes that were placed in the bottom of the base to secure the clock to the wall. Mechanical: The eight-day, time-only, weight-powered, nickel-plated movement with sweep center seconds, is powered by two weights and regulated by seconds-beating wooden rod and nickel-faced pendulum bob. The movement has recently been professionally overhauled and the calendar mechanism serviced. 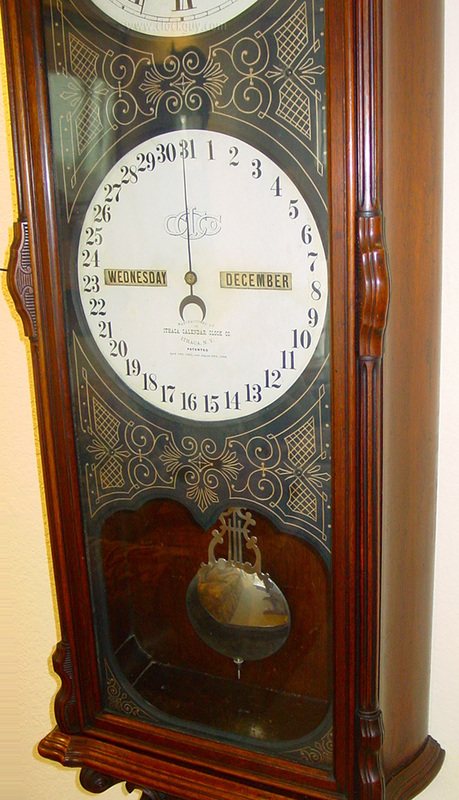 Both the clock movement and perpetual calendar mechanism function correctly. The calendar recognizes and compensates for leap years. Nice! Comments: This is a fabulous clock that does everything but wind itself; that'll be your adoring job once a week as you and the clock pass time happily together. Give us a call to start the love affair in your home! We've only had a couple of this model in the past. Most remain securely locked in major collections, not even remotely available. As you look, consider that the photos don't accentuate the fact that this is a large clock, 50" in length. 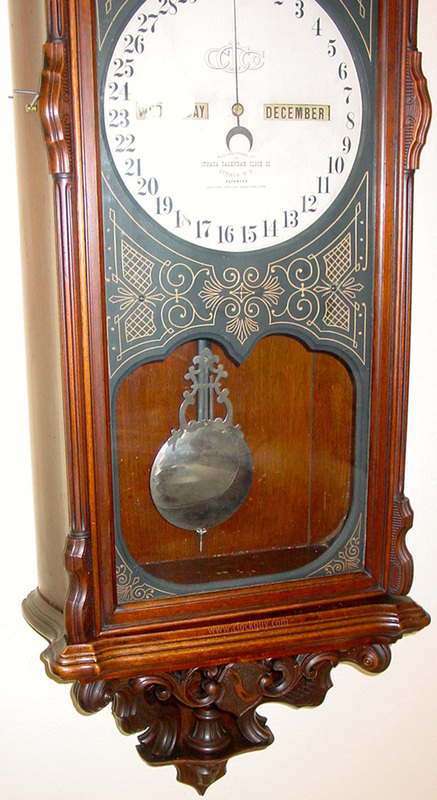 This model was featured in the Seth Thomas catalogues from 1879-1893. 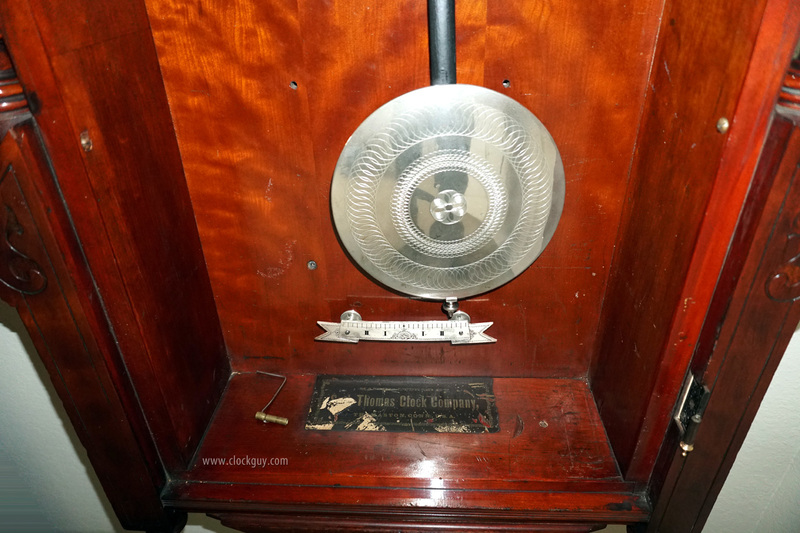 Also, be sure to look at the unusual viewing window in the bottom through which you can see the nickel pendulum bob. 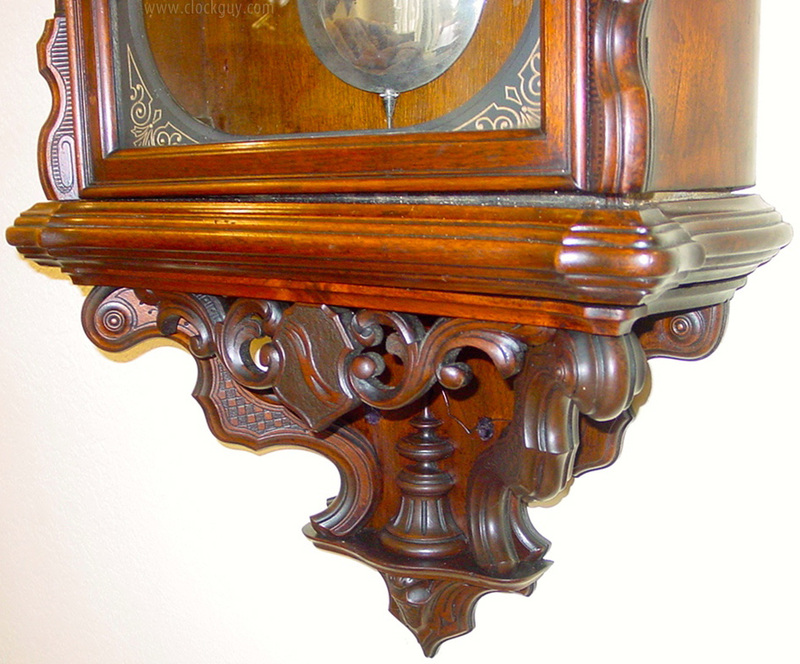 Seth Thomas used burled wood judiciously on its higher-end clocks. 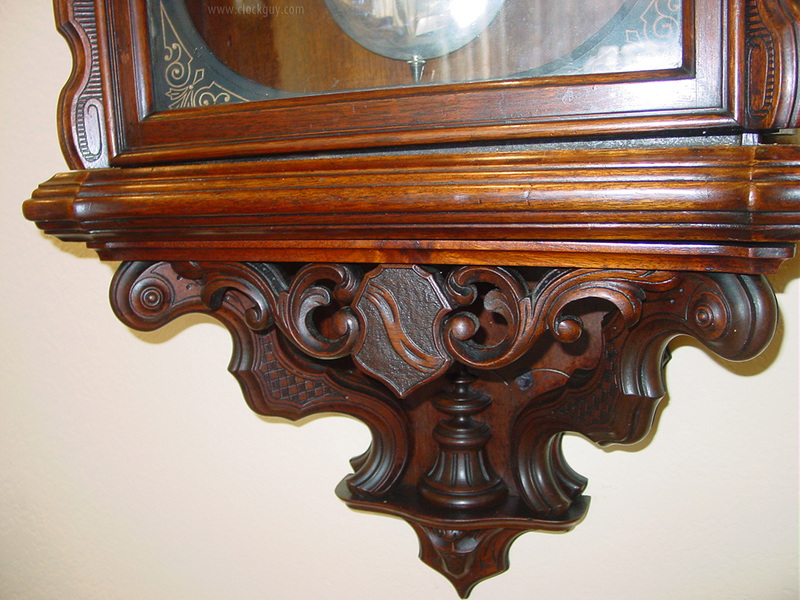 This is a great example of their woodworking skill and phenomenal attention to detail throughout the case. Physical: This Office Calendar No. 5 is in excellent physical condition. It measures 24"w x 50"h x 8"d. The walnut burl finish has been restored, having recent professionally applied additional coats of shellac, just like in the factory, hand-rubbed between coats. It is beautiful. 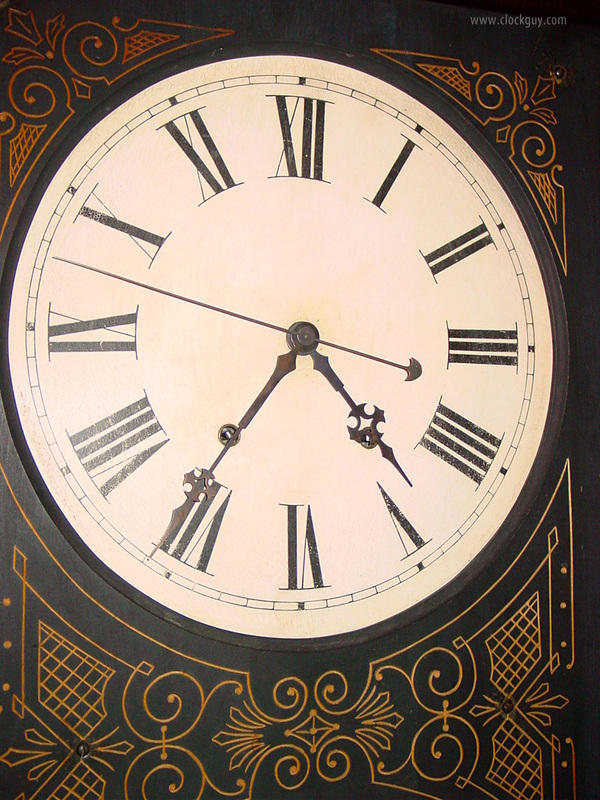 The 14" diameter dials have the original paint that was touched up by Kathi Edwards at the famous Dial House in GA. Both are in excellent physical condition. Interestingly, the calendar dial is also painted on the back and there are a bunch of signatures. 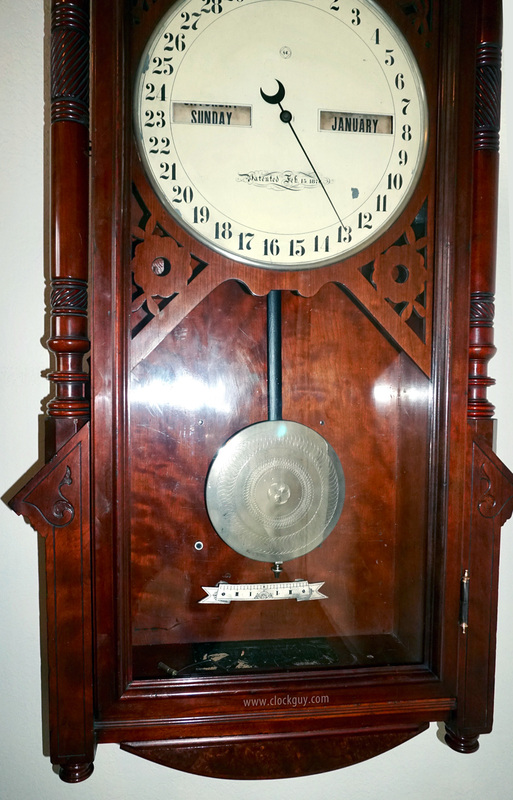 The collector from whom our consignor originally purchased the clock claimed that the clock came from one of the major Hollywood studios and that the signatures have some significance. Not apparent to us, but an interesting tidbit of supposition! The roller papers, hands and weight are original; movements are original to the case. Again, it's a beautiful specimen, just waiting for you. Mechanical: The signed eight-day, time-only, single-weight clock movement and the 31-day R.T. Andrews-patent calendar movement are both original to the clock and in excellent running order. Both were recently professionally overhauled. Comments: This is a model that is not often available. It is so popular that (beware) the Chinese export knockoffs. This clock is the real McCoy. Is it the one for which you've been patiently waiting for such a long time? We've only had a handful of this Seth Thomas model in the past and are delighted to have "two flavors" to offer you at present (see STF-0901 above), one in walnut burl and this one in oak – perhaps one for home and one for the office? 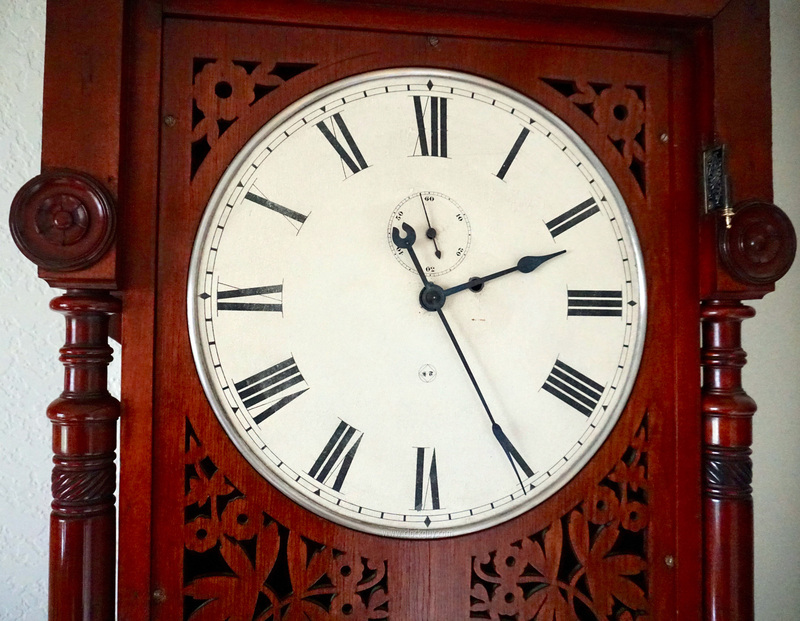 This is a large clock, 50" in length, and will make a statement wherever it is hung. This model was featured in the 1879-1893 catalogues. 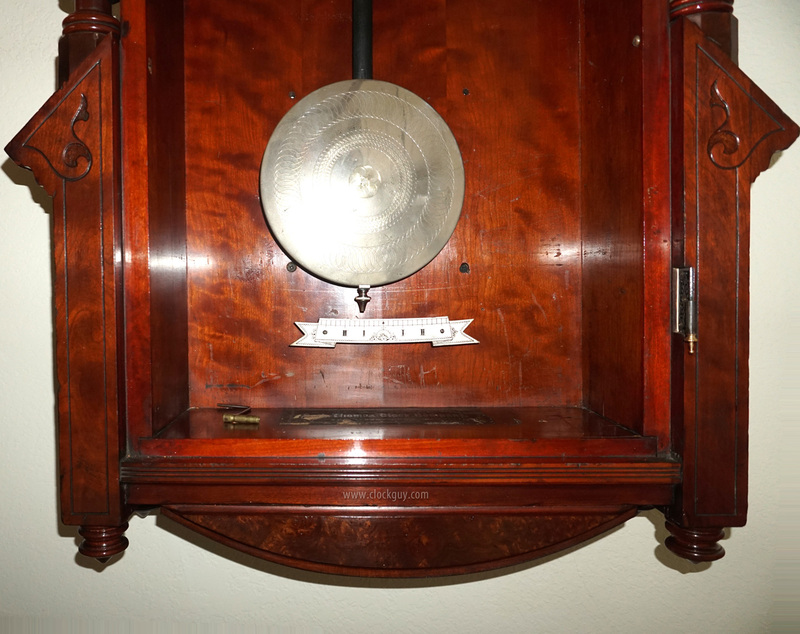 Be sure to look at the unusual viewing window in the bottom through which you can see the pendulum bob. 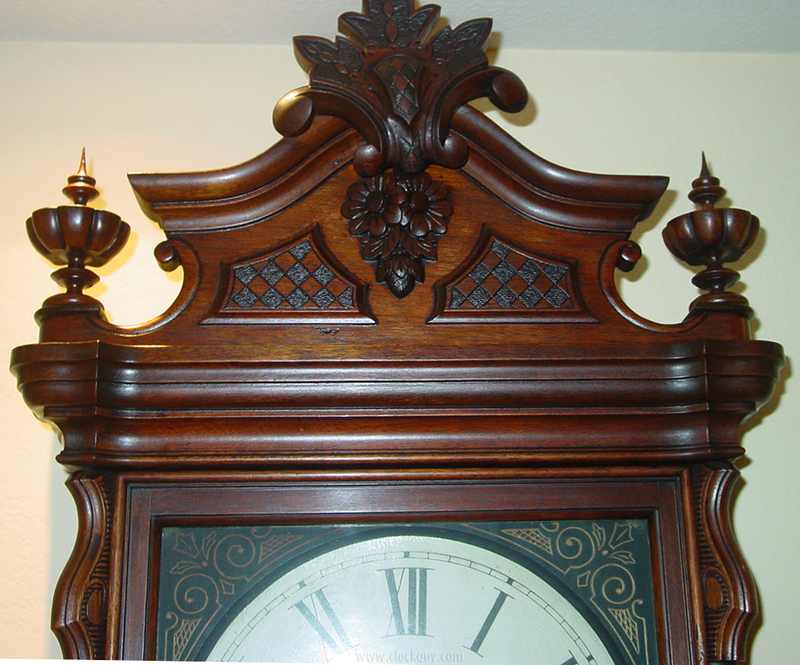 This is a great example of the high woodworking skill and phenomenal attention to detail typical of the Seth Thomas firm. Physical: This Office Calendar No. 5 is in excellent physical condition and measures 24"w x 50"h x 8"d. The finish is original as is the wavy glass, pendulum and weight. The 14" diameter dials both have the original paint. Both are in good, age- appropriate physical condition. 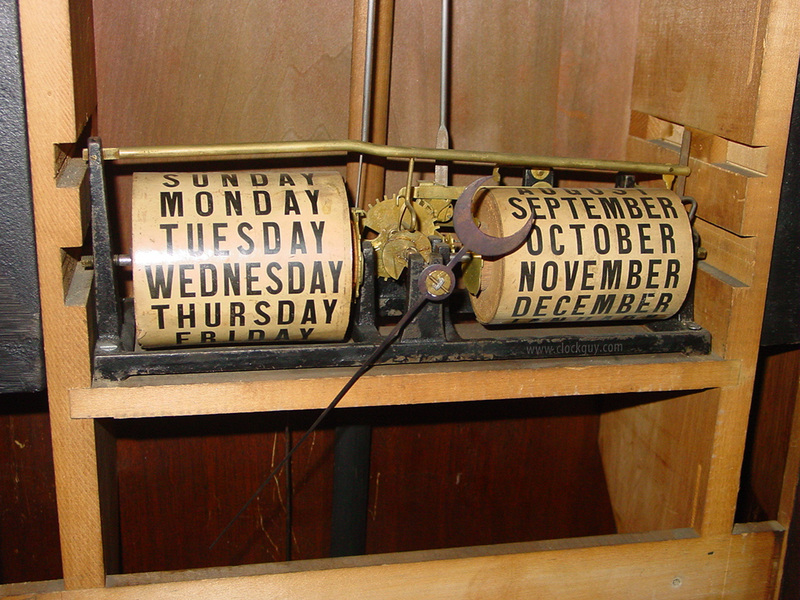 The roller papers, hands and weight are original (there has been a small repair to the calendar hand). Mechanical: The signed 8-day, time-only, single-weight clock movement and the 31-day R.T. Andrews-patent calendar movement are both original to the clock and in excellent running order. Both were recently professionally overhauled. Comments: This is a model that is not often available. It is so popular that (beware) the Chinese export crummy quality knockoffs. 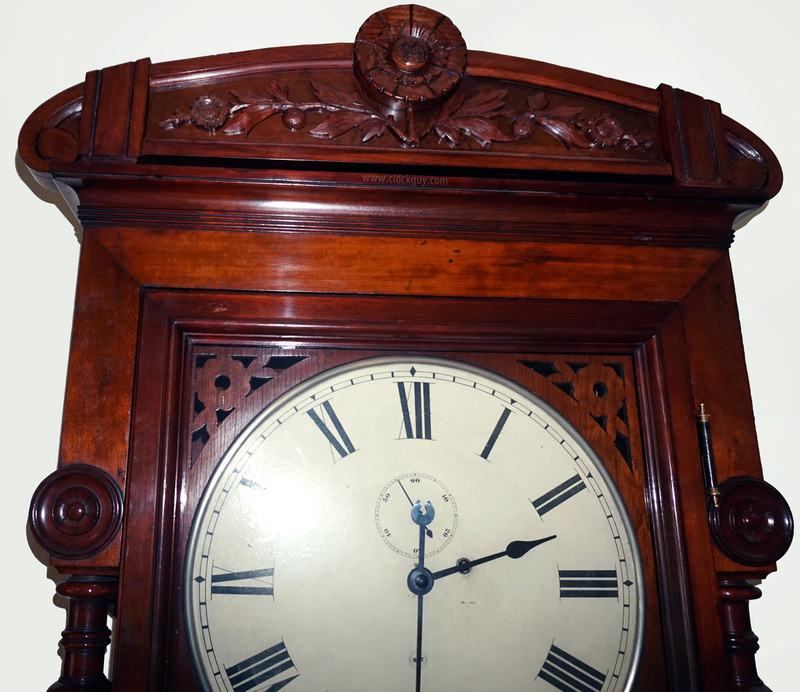 This clock is the real McCoy waiting and ready for you... and at a great price.